This morning, legendary conductor of the Israel Philharmonic Orchestra, Maestro Zubin Mehta, emotionally announced that he will retire as musical director in October 2019. At his retirement, Mehta will have served as the musical director of the Israel Philharmonic for 50 years. He first came to the Israel Philharmonic in 1961, as a replacement for legendary conductor Eugene Ormandy. The Israel Philharmonic Orchestra appointed Mehta as musical advisor in 1969 and as musical conductor in 1977. In 1981, it extended his term for life. 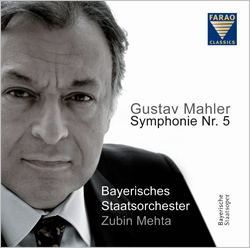 Maestro Mehta has conducted the Israel Philharmonic in thousands of concerts, recordings, and tours on five continents. This morning, Maestro Mehta convened all of the Israel Philharmonic’s musicians and employees, and in an emotional announcement informed them that he intended to retire from his position at the orchestra in October 2019. He reviewed the Israel Philharmonic’s development since first coming to it, and praised the exceptional path it has taken over the years and its current level of excellence. Maestro Mehta is greatly appreciated for his work with the Israel Philharmonic in particular and for his musical activity in general. He has been awarded numerous honorary degrees in several countries, including honorary doctorates from the Hebrew University in Jerusalem, Tel Aviv University, and the Weizmann Institute of Science in Israel. The Hebrew University has also named its Department for Musicology for him and his late father. In 1991, he was awarded a special Israel Prize. He won the 1995-96 Wolf Prize in the Arts. 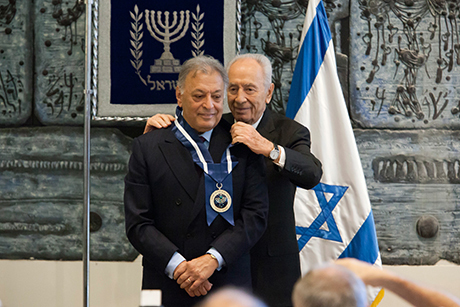 Zubin Mehta is an honorary citizen of Tel Aviv-Jaffa and Florence, and an honorary member of the Vienna State Opera (1997), the Bavaria State Opera (2006), and the Society of the Friends of Music in Vienna (2007). He has been bestowed the title of honorary conductor by the Vienna Philharmonic Orchestra (2001), the Munich Philharmonic Orchestra (2004), the Los Angeles Philharmonic Orchestra (2006), the Teatro del Maggio Musicale Fiorentino (2006), and the Bavaria State Orchestra (2006). In September 2006, he was awarded Una vita nella musica - Arthur Rubinstein at the Teatro La Fenice in Venice, in December 2006, he was a recipient of the Kennedy Center Honors, and in March 2007 he was awarded the Dan David Prize. For the 12th and 13th November 2016 Luca Benucci and Prof. Otto Sauter have organized, together several colleagues, friends and companions, a charity gala "Zubin Mehta & Friends“ to celebrate the 80th birthday of Zubin Mehta and to support the Mehli Mehta Music Foundation. The event will take place on the Arlberg Hospiz Hotel and the arlberg1800 Contemporary Art & Concert Hall. Bayern 4 Klassik is featuring on Thursday, 20th October 2016 at 19.05 h the question of Zarathustra in the music. 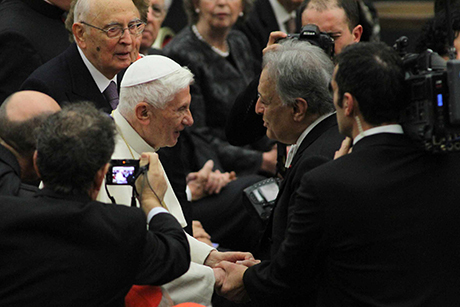 Florian Heurich speaks with Zubin Mehta of various aspects of his religion in music. Yesterday evening, July 29th 2016, the Board of Fondazione Teatro di San Carlo appointed Zubin Mehta (born in Mumbai in 1936), as Honorary Conductor: Zubin Mehta, for the outstanding international achievements, from the Sixties until nowadays, has become a living legend and tours with him are already arranged in the next seasons. 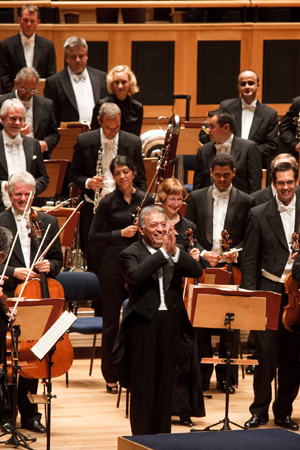 With a benefit concert in Israel for the volunteer’s organization „Road of Recovery“ Zubin Mehta supports their work in bringing children with severe health problems from Palestine to hospitals in Israel (https://youtu.be/w46xkGIPm0k). He accompanied also a little girl and you find here (https://www.facebook.com/theroadtorecovery1/videos/1014276375356563/) an impression of this unforgettable experience. Furthermore, Zubin Mehta will be conducting Orchestra and Chorus of Teatro San Carlo next June in Milan (Beethoven’s Ninth Symphony) and in September at San Carlo Beethoven’s Fidelio (23rd and 25th September 2017). Live-transmition of Zubin Mehta's birthday concert with the Israel Philharmonic Orchestra in Mumbai on the 17th April 2016 at 17.30 h German time and the documentary of Bettina Erhardt at 22.30 h.
The Mehli Mehta Music Foundation is presenting the Israel Philharmonic Orchestra and Zubin Mehta in his hometown Mumbai in three concerts to celebrate his 80th birthday. The concert on Sunday, 17th April 2016 with Pinchas Zukerman performing the Beethoven Violin Concerto will be shown on ARTE at 17.30 h.
At 22.30 h ARTE will present Bettina Erhardt's documentary on Zubin Mehta. The new production of Giuseppe Verdis Un ballo in maschera will be available for streaming on 18th March 2016 (from 10.10 pm). In addition, the Bayerische Staatsoper is pleased to be able to offer the entire, full-length performance for a whole week. Until Easter Sunday you will be able to watch Anja Harteros, George Petean, Piotr Beczala and Zubin Mehta performing in a Johannes Erathproduction – as many times as you want! The live-stream, originally planned for 19th March, was cancelled due to the collaboration with the broadcaster ARTE. Instead, the performance will be broadcasted at Staatsoper.TV on the 18th March, simultaneously to the broadcast on ARTE. On Saturday, 21st February 2015 at 20.15 h Servus TV transmits the performance of Giuseppe Verdi's Aida live from La Scala in Milano. Unter the baton of Zubin Mehta you can experience Kristin Lewis, Anita Rachvelishvili, Fabio Sartori, Carlo Colombaro, George Gagnidze in the production of Peter Stein. After the very sad passing of Lorin Maazel, his much treasured colleague, Zubin Mehta will conduct the Munich Philharmonic on the 3rd October 2014 and will conduct the new production of Aida at La Scala as well as two concerts in February / March 2015. 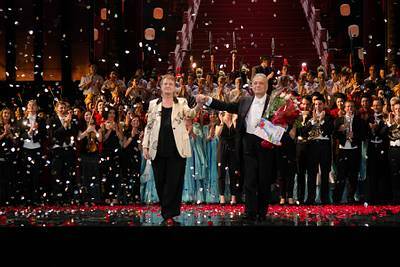 Zubin Mehta and Intendente Helga Schmidt after the last performance of Turandot in the Festival del Mediterrani with orchestra, soloists and choir of the Palau de les Arts on the 15th June 2014 in Valenica. 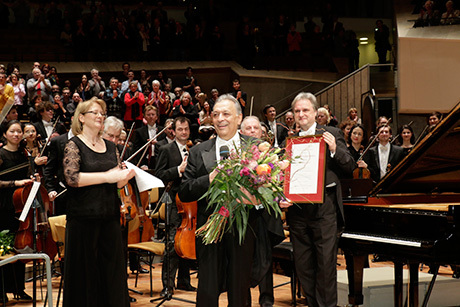 After the concert on the 10th February 2014 in the Philharmonie in Berlin Zubin Mehta was appointed Honorary Conductor of the Staatskapelle Berlin. He said: "It is a huge honor for me as I admire this orchestra very much and look forward to our future collaboration". Zubin Mehta is looking very much forward to conduct the Vienna Philharmonic after 1990, 1995, 1998 and 2007 for the fifth time at their New Year's Concert on the 1st January 2015. 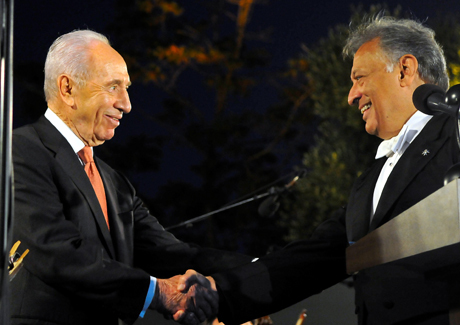 The President of the State of Israel, President Shimon Peres conferred the Presidential Medal of Distinction upon the conductor Mr. Zubin Mehta at a special event at the President's Residence on the 15th October 2012. The Presidential Medal of Distinction was awarded to Mr. Mehta for his outstanding contribution to culture in the State of Israel. Mr. Mehta is the music director of the Israel Philharmonic Orchestra and a world renowned conductor. 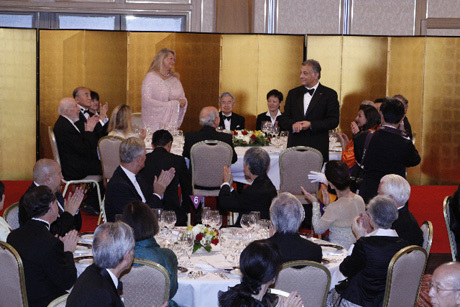 The event was attended by the American ambassador to Israel, Mr. Dan Shapiro, the Deputy Chief of Mission of the Embassy of India, Ms. Vani Rao, the heads of the Israel Philharmonic Orchestra and the members of the advisory council for the Presidential Medal of Distinction including the Fifth President of Israel, Mr. Yitzhak Navon, former President of the High Court, Justice Meir Shamgar, Dr. Gil Shwed, Professor Anita Shapira, Professor Suzy Navot, Dr. Muhammed Issawi and Dr. Rabbi Razon Aroussi. President Peres presented Mr. Mehta with the award and the two shared a warm hug. President Peres said to Mr. Mehta, "Zubin you came here to conduct an orchestra but you became the conductor of our hearts. You know I can't think of anybody else who has offered such a unique contribution to our country, to our people and to our mood. You have shown leadership, a leader was born to elate the spirit and the hopes of the people. That's what you did." President Peres added, "Israel used to be a drama and you made us into a dramatic symphony without compromising one for the other. You made our people feel at ease, feel together through the language of music. You and the orchestra carried a flag of friendship across the world and represented our country in an unbelievable manner. Music conducted by you became a message for peace, a message of hope. I feel honored and privileged to express from the depth of our hearts our thanks to a person who is so unique. Thank you on behalf of our people and our country for this unique contribution." Upon accepting the award Mr. Mehta said, "To be given a hug by President Peres is already my award. There is no greater friend of India in Israel than Shimon Peres. I don't think there is an important book on India that Shimon Peres has not read, he practically knows more about my country then I do. For all those years when India had no representative in Israel Shimon Peres always named me unofficial ambassador. What Israel has given me in the last 50 years I can only give back by having my musicians night after night play their hearts out all over the world." Mr. Mehta paid tribute to the Israeli Philharmonic Orchestra and to the musicians he has conducted in his career both in Israel and during his time in Los Angeles. Mr. Mehta described coexistence in Israel as his dream and said after the performance of the Mifne choir, in which Arabic and Jewish singers perform together, "that if you can sing together, you can live together…I wish for this country only peace and harmony and a vision of living together." The Presidential Medal of Distinction is awarded to private individuals and organizations that have made unique and outstanding contributions to Israeli society and the State of Israel's image around the world, and which constitute examples of initiative, innovation, creativity and vision. The medals themselves feature the North Star to symbolize the right path and a menorah, the symbol of Israel and the continuous link between past and present. The medal is crowned with the words from Samuel 9:2 "from his shoulders and upward." In his speech Ambassador Steiner said: "You are an ambassador at large for classical music. You are the ambassador of Wagner, Beethoven, Mozart, Mahler, Bruckner and many others - many of them German composers. And you are the admired former music director of the Bavarian State Opera. Maestro Zubin Mehta, these were some of the reasons why the President of the Federal Republic of Germany, Dr. Joachim Gauck, in recognition of your special contribution to Germany and her international relations, as well as your life work in the service of music and cross-cultural understanding, has decided to bestow you the Commander's Cross of the Order of Merit of the Federal Republic of Germany." You have proven that an almost invisible baton can conquer the hearts of people better than guns. To paraphrase Isaiah: you have shown that you can beat swords into batons and spears into violins. You arrived here from the depths of India as a young talent and you became the master of our most significant cultural institution, the Philharmonic, capturing the hearts in Israel, and for Israel. Orchestra after their performances in Tokyo in November 2010. Paulo, Rio de Janeiro and Buenos Aires in September / October 2010. Mo. 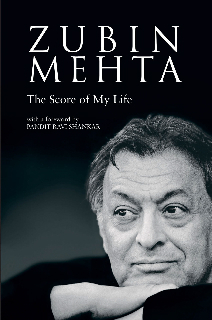 Mehta received the Yehudi Menuhin prize 2010 by H.R.M. Queen Sofía. Due to the sudden passing away of the Vice President of Tel Aviv University, the beloved Mr. Yehiel Ben-Zvi, a decision was made by Mr. Buchmann and Maestro Mehta to honor Mr. Ben Zvi with a tribute concert at Tel Aviv University within the frame of the annual Board of Governors. Mr. Ben Zvi was the leading figure and driving force in planning the concert in Frankfurt, and we hope to resume his vision for this concert next year. I'm sitting here on stage in Tel-Aviv, at the 100th anniversary celebration for my beloved city Tel-Aviv, in Israel, which I love from the depth of my heart. And yes, I am proud to be invited to take part in this moving celebration for my Tel-Aviv. Deutsche Grammophon and Decca present a new internet site to present two new series - DG concerts and Decca concerts with the possibility to download two recordings of Mo. Mehta. Né en 1936, Zubin Mehta est un cas particulier. 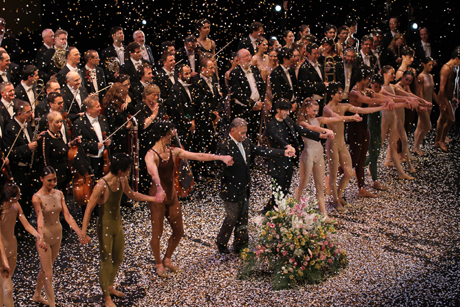 Il fêtera en 2011 le cinquantième anniversaire de ses débuts avec l’Orchestre philharmonique de Vienne – circonstance exceptionnelle, et pourtant triple, car il en ira de même pour le Philharmonique de Berlin, et celui d’Israël !(1). Il revient aujourd’hui sur les liens anciens qui l’unissent aux Wiener Philharmoniker, l’ensemble la plus proche de son cœur avec l’orchestre d’Israël (« ma maison »), dont il est directeur musical à vie. Vous êtes arrivé à Vienne très tôt, à peine âgé de dix-huit ans ? 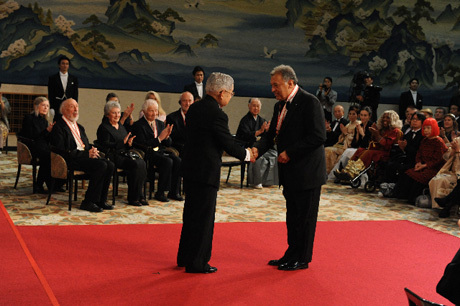 Zubin Mehta receiving a medal from Prince Hitachi, honorary patron of the Japan Art Association, at the awards ceremony of the Praemium Imperiale on 15th October 2008. The maestro waves his wand. His trust will promote western classical music in India. "So Mr Zubin Mehta, can you please tell me, do you belong everywhere or do you belong nowhere?" I'm sitting with the maestro in the gleaming lobby of the Taj Mahal Hotel, Mumbai, home for a week to the Israel Philharmonic Orchestra, one of the greatest in the world, with which Mehta has shared a long and special relationship. A few kilometres away, at Cuffe Parade, is his childhood home, where as a five-year-old boy he used to conduct imaginary orchestras, standing on an old vegetable crate. The Japan Art Association today announced the names of this year’s Praemium Imperiale Laureates who have been selected in this 20th anniversary year. Mr Hisashi Hieda, the acting Chairman of the Japan Art Associations says “Twenty years ago, the Japan Art Association established the Praemium Imperiale to honour artists whose work has touched and inspired people across the globe. This anniversary year represents a significant milestone for us. The creative work of the Praemium Imperiale Laureates is timeless and transcends borders and nationalities." 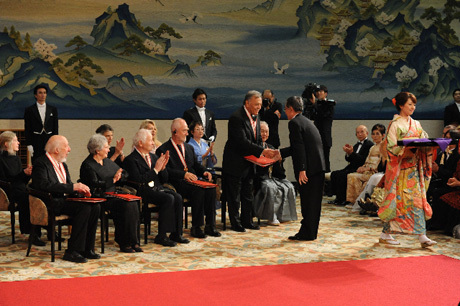 The Awards Ceremony in October in Tokyo will be presided over by the patron of the Japan Art Association, Prince Hitachi (the younger brother of the current Emperor) and to mark the importance of this 20th anniversary, this year’s Laureates will be joined in these celebrations by many of the Awards’ previous recipients. 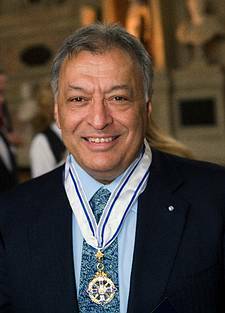 Zubin Mehta: "I am deeply honoured to be added to this list of outstanding honorées that I admire since a very long time. I look very much forward to come to Tokyo in October to receive the Praemium Imperiale". 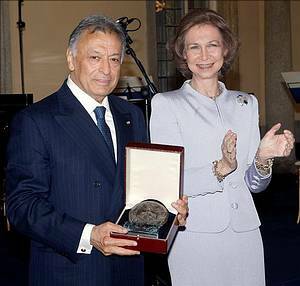 Queen Sofía of Spain congratulates Zubin Mehta, who was honored with the Doktor honoris causa of the Universidad Politecnica de Valencia on the 24th May 2008. 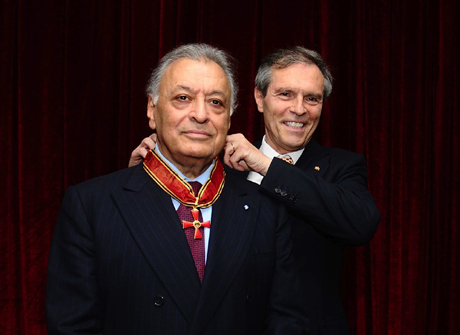 On April 17, 2008 Zubin Mehta was awarded the Maximiliansorden(Order of Maximilian) by the Prime Minister of Bavaria, Dr. Günther Beckstein, to honor him for his outstanding achievements in the artistic field. The Bavarian Maximiliansorden for Scholarship and Art is reserved to only 100 honorees, primarily German scholars and artists. The high state honor was initiated by Bavaria’s King Maximilian II in 1853. Following an interruption in 1932, the award was reinstated by then Governor Franz-Josef Strauss in 1981 and takes place every two years. Dirigent Zubin Mehta über Giuseppe Verdi, digitale Klassik, das indische Kastensystem, arrangierte Ehen und die Premiere von "La Forza del Destino" an der Wiener Staatsoper. Jahren während einer Aufführung der Luster heruntergefallen ist. 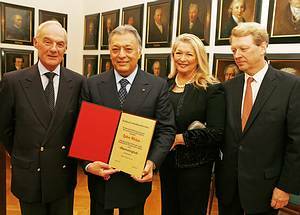 During his last visit with the Orchestra del Maggio Musicale Fiorentino at the Musikverein in Vienna, Zubin Mehta was given the great honour of being made Honorary Member of the Gesellschaft der Musikfreunde in Wien. This puts him in a long line of Honorary Members such as Gustav Mahler, Johannes Brahms, Giuseppe Verdi, Leonard Bernstein, Herbert von Karajan.